Read The Generation of Degenerative Back Pain by Dr. Marc Belitsky to learn more about Broomall Total Health Center and our Chiropractic office in Broomall, PA.
Next time you are out, look to the person on your left and right or better yet look at the group of people who are just a short distance from you. What you may notice is the rolled shoulders and head forward posture. No, it is not the cell phone they have in their hands that they are staring intently into, but their now adapted postures due to those and other computer devices that have become the absolute norm of our American generation lifestyle. Although we are way ahead in technology, unfortunately, our generation is leading the way in spinal degeneration, arthritis, and chronic illnesses. Lower back pain is now so common that it affects almost 90% of adults with the majority suffering from lumbar arthritis as a contributing factor to their lower back pain. The spine is composed of twenty-four moving segments, known as vertebrae, classified into three regions: cervical (neck), thoracic (mid-back), and lumbar (lower back). Between the spinal vertebrae are intervertebral discs that act as shock absorbers. 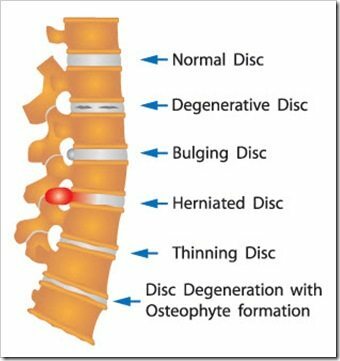 Theses discs are anchored to the vertebrae by the collagen fibers allowing movement between vertebrae and the distribution of weight bearing forces from one vertebra to the next in the spine. The intervertebral discs often lose their elasticity and hydration with age and poor posture or as the result of an injury. The loss of elasticity decreases their ability to handle all the load bearing forces of daily activity. When the discs thin, this changes the relative position of the vertebrae and the connective tissues throughout the rest of the spine. Over time, this thinning of the disc could progress to where the vertebra is effectively lying on the next vertebra. The loss of disc space often results in increased pain and decreased ranges of motion. Ultimately, this pattern of degeneration can lead to microfractures and cartilage injury. Although the body tries to replace and repair the damage, it is often insufficient to overcome the degenerative process without assistance. The classic symptomatology of arthritis includes joint pain, swelling, and stiffness. As with most forms of osteoarthritis, pain and stiffness are the most pronounced symptoms in the morning. As movement increases over the course of the day, the symptoms tend to subside. In general, if there is no evidence of nerve root compromise, pain from an arthritic spine is localized with possible dull aching. If the degeneration of the spine continues into a diagnosis of spinal stenosis patients may experience numbness, tingling, or weakness in the legs due to irritation of the lumbar nerve roots. Lumbar arthritis and back pain is usually responsive to conservative management. During an acute attack of back pain, relative rest that avoids activities that aggravate the symptoms may reduce inflammation. Drinking moderate amounts of water frequently while minimizing caffeinated drinks will also be beneficial in helping hydrate the discs. For long term relief, lifestyle modifications must be undertaken. This includes weight loss when appropriate as it will have a tremendous impact on reducing back pain due to the lumbar spine bearing the weight of the upper body and weight of the head. Exercise is also critical as it will contribute to reducing weight while increasing muscle strength to support the lower back. You should consult your chiropractic physician before beginning any exercise or diet program. Your chiropractor and their spinal rehabilitation team may prescribe spinal decompression in combination with rehabilitative therapy. Working with a rehabilitative team to design a proper exercise regimen will be useful for strengthening core muscles and minimizing your back pain. Our team understands that long-term back pain is not only physically debilitating but emotionally exhausting. To serve our community, we have built an expert team committed to working together harmoniously to help you or your loved ones recapture the quality of life they desire – pain-free! This entry was posted on Thursday, August 17th, 2017 at 7:03 pm and is filed under Health Articles. You can follow any responses to this entry through the RSS 2.0 feed. You can skip to the end and leave a response. Pinging is currently not allowed.